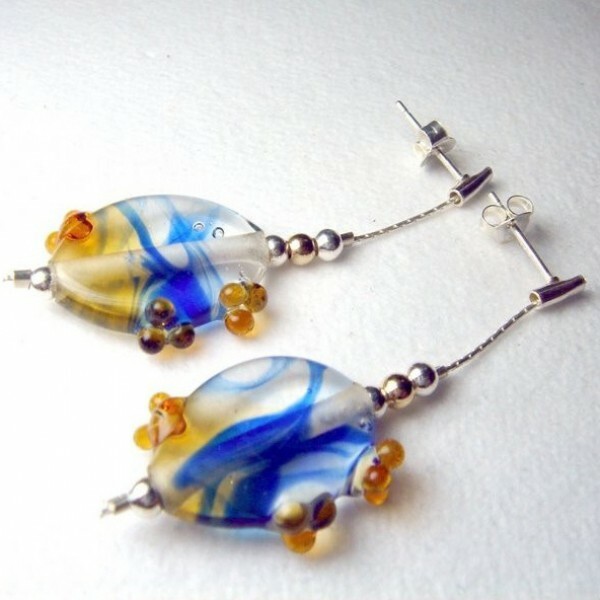 Blue-yellow fused glass earrings. Sterling silver drop studs. Hand crafted by Jana Soberman. Composition: Fused Glass & Sterling Silver. Colour: Blue, Orange - Brown and sterling silver hanger. Elegant drop earrings handmade by jewellery designer Jana Sobelmann of JanArt. Each earring is sterling silver and features a large glass stone in blue, orange and white. By JanArt Israel.